Every day things happen around the world. Some things that make us happy to read about, others that make us sad. Certain stories affect people differently and certainly no tragedy should be measured against another. Earthquakes in Haiti and Chile, flooding in Pakistan, war in the Middle East, atrocities in Darfur are just a few examples of several heartbreaking situations. You read about these things in the news, or see stories about them, or know someone affected and it may cause you to stop for a minute and think about just how fleeting our small lives are. Many of us want to do the right thing and we donate to the Red Cross or offer to volunteer. Helping those in need is what makes us Human, what shows our true nature as compassionate people. For the past three years, I've deployed to Antarctica. As part of those deployments I've cumulatively spent a significant amount of time in New Zealand (all on the South Island). Just two weeks ago I was leaving the ice for home and was taking a few days to relax in Christchurch. The United States Antarctic Program is based there and everyone going to Antarctica to support NSF funded science must go through this wonderful city. Two years ago, on my first trip down, I was blown away by not only the entire country of New Zealand, but by the beauty of this amazing city. The people of New Zealand are truly kind and generous. It is an incredible place...a place that I think the United States can learn a lot from. People are polite to one another and look out for each other. Crime is low, people are treated with respect, and the sick are taken care of. For three years now I've considered New Zealand as somewhat of a second home (as well as Antarctica). I eagerly anticipate my time there and when I am there, I am overcome by a wonderful calm...a calm that is often hard to find back here in the States. On my way down this past season, Christchurch was still hurting a bit. 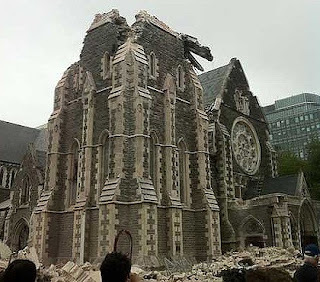 In September they were hit with a magnitude 7.3 earthquake. There was a lot of damage to the city's older brick and stone buildings, and many other structures were deemed unsafe. The quake's epicenter was well outside the city though, and so it was somewhat spared (and no one was killed). By the time I made my way through in late November, most of the damage was cleaned up, the buildings were being repaired, life was starting to move along again, and the morale was high with the people. In fact, it almost seemed that it brought everyone together. People were more united than ever and looking ahead, rather than looking back. Charity funds were coming in, and while still hurt....the city was healing. Coming home from a movie last night, I checked my email and was flooded with all sorts of news regarding the new 6.3 quake that hit yesterday...and I knew it was bad. Really bad. This one truly breaks my heart....makes me very sad. Such a wonderful and beautiful city, with incredible people. So...I'm asking you all today...while you are going about your business, driving to work, walking the dog, or sipping that morning coffee. Stop for a second and just think about the people and the city of Christchurch who are extremely hurt right now. Think about the people the died and their families. Also...take a moment to think about the many US Antarctic Program employees and scientists still unaccounted for there (some of whom I worked with at WAIS Divide). Think about the people who were going about their business yesterday and had their lives changed in an instant. Think about how maybe...you can help them. Like I said, no tragedy should be measured against another...and certainly they are all just that: tragedies. But this one hit real close to home for me. Haven't posted anything on here since getting back from Antarctica, but I wanted to briefly put up some thoughts concerning one of Apple's iPhoto features. Following both my AT and CT thru-hikes, I decided I not only wanted digital images...but that I wanted an actual, tangible photo album. I know, it's a little old school, but there something about having a physical album to flip open and go through. The downside of course is this can get expensive. For both the AT and CT hikes, I simply brought my photos up to the local "big-box"store, used a Kodak digital-photo center, and waited as my photos (over 400 for the AT) printed out. Add in the cost of some nice albums and making these albums cost me over $100.00 for each (The CT was a bit cheaper). The problem I found was that the printed photos never looked as nice as the digital copies. Obviously, I was printing raw images at a Kodak kiosk...and knew they wouldn't be spectacular. So....moving to the present, I have been reluctant to make a photo album for my PCT hike. I had almost gone through the process before heading to Antarctica, but then decided to wait. While on the ice, I was messing around in iPhoto and noticed that Apple now has a "Create/Buy photo album option". You can basically design a photo album, and then upload that design with photos to an apple website...pay a fee...and they mail you an album. So this is what I did. And I decided to do it right. - First, I went through all of my photos and decided what I wanted to include. There is a 100 page limit to iPhoto albums and I didn't wan't more than two albums. - Second, I went through each photo, individually, and "enhanced them" in iPhoto. This doesn't necessarily mean I just pushed the "enhance" button. Sometimes, I adjusted the shading, sometimes the contrast, sometimes the exposure. This was a very time consuming process and took me several hours over several nights, but the resultant photos were exactly as I wanted them printed. - Next, I picked a theme I liked and started importing all the photos into the albums. I knew I would have two books so I tried to split the pics in half. - Next, and this was the most time consuming part, I went through each page and designed the layout. You can have several pics on a page, or just one. So I went through each photo and each page deciding which pictures I wanted to make larger (and which ones could be made smaller). Some that I chose were simply more beautiful, some represented a more vivid memory. This is where my personal thru-hike stories and experiences really came into play. I had to be careful not to blow up too many pictures as space was limited. I also decided to add some text on the front and back of the dust cover as well as on the first and last pages. I went through the quotes and blog postings that most clearly represented my thoughts on this hike and went with ones I thought fit best. -Finally, I proof-read everything and submitted. It was expensive (about $100.00) so I was nervous. I decided to only buy the first book and keep the second one on standby in case the quality was terrible. Overall I'm very pleased with the book. The quality itself is very high and the photos, while still not quite as good as their digital counterparts, are much nicer than from the Kodak kiosk. Last page. This entry comes from a quote, courtesy of Jonathan Ley.